The advice below is all about arranging, recording and editing videos of speaker presentations, panel sessions and interviews about innovation, conducted in front of live audiences. Thumbnails: A real boost comes from the thumbnail looking as if it is a speaker (or panel) giving a presentation to an audience. This kind of imagery suggests that maybe there was a real audience (‘social proof’) so someone just might be encouraged to check that video out if it is on a topic they follow. At the moment, thumbnails in video search result lists are small and have poor image quality. Title: Something in the title should be connected to innovation: words like new, change, future, tomorrow’s, transformation, or even, dare I say it, ‘innovation’. Textual info which accompanies the video: The more detail, the better. Put the date when the presentation was given at the top. Include a link to a ‘presentation landing page’ on your website. Introductions must be very, very short. Conspicuous editing often reduces a sense of realism, so the only mandatory ‘cut’ should be to edit out introductory banter, removing administrative detail, sponsor acknowledgements and speaker biographies. The way to include all of the introductions you need, without the casual user needing to be deterred by ‘introductory footage’, is to edit in overlaid captions at the bottom half of the screen, being careful not to not let the captions disrupt the speaker’s ‘presentation visuals’. Advice to those who haven’t yet made their innovation video: do the presentation in front of an audience. Got a good innovation story PowerPoint, such as a pitch to prospective investors? Stage a ‘nano-event’ somewhere (an office at a customer site?) and get a handful of spectators and video your presentation with them as the audience. Do not edit the video to make it look like an ad, do not ‘edit-in background music’, do not ‘try to make it look cool’ by ‘cinematic’ editing. Keep it real: The only editing other than cutting out the intro and overlaying the captions, should be to deal with any readability problems with the presentation slides, by filling the screen with them at the right moments. 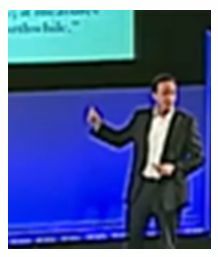 Sound is critical: eliminate picking up echo from large rooms: ‘mike up’ the presenters rather than using a camcorder’s built in microphone. Video a rehearsal of the presentation: (or at least part of it) then check the video for position, lighting and sound and go to work on fixing such things as ‘presenters invisible in the darkness’, too much reflected overhead light from people’s foreheads, inaudible presenters, booming, extraneous or distorted sound. Then repeat until you’ve got it right.